Perfect. Heartrending. One of the top listening experiences I have had on audible. What made the experience of listening to Sons and Lovers the most enjoyable? This is an extraordinary novel. I have never read anything quite like it, especially in terms of how it delineates mother-son relationships in terms of the most advanced psychology, all played out through the scenes and characters rather than through explanations. This makes it very in touch with how feelings create reality, and also an endless source of psychological truth which is as current today as ever. It's also impeccable in its language, both simple and lush, and seems to have been painstakingly crafted to give it that simplicity and weight. Jenny Sterlin's performance is very strong and earthy, and I think this lends a lot to the feeling and texture of the book. One thing that's great about her performance is that one feels the presence of the mother at all times in her, which is what the book is about - the son's enmeshment by the mother. I chose a female narrator for that reason, and I was not disappointed. There are times when her performance almost seems grim, and sometimes I was aware of happy moments in the book that were read with that same veneer of grimness over the upbeat tone, but in the end I think that is also correct for this novel. She also does regional accents and men's voices extremely well. The deliberate slowness with which she reads also highlights Lawrence's deliberate and careful sentence construction. Highly recommended. There are many astonishing moments in the book, particularly towards the last half. I found my jaw dropping open repeatedly as the relationships that were set up in the first half start to have their consequences later. Particularly haunting for me were the scenes between Paul and Miriam, in which his inability to love her is played out in all sorts of ways, all painful. But I don't want to give too much away! It may be sacrilege to admit but I did not love anything about this book. Despite writing contemporaneous with James Joyce, Lawrence makes this period, even the working class, seem tedious, boring and pedantic. You would think that the collier class would be interesting and lively but, at least from Lawrence's perspective, the drunken and terrible ones are so self conscious that they don't make the best of their low lives. 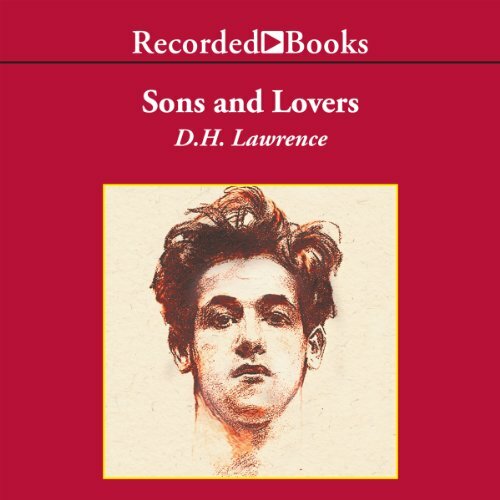 Sons and Lovers is supposed to be somewhat autobiographical, written as Lawrence was sitting shiva as his mother lay dying. Perhaps it was a way to work out his crushing familial uncomfortability . "..but a stroke of hot stubbornness inside his chest resisted his own annihilation." it was a long read to find the one chestnut. On the upside, by completing "Sons and Lovers" I have now read the Top 10 recommended books of the Modern Library Top 100 novels. I don't think I share their opinion that this novel belongs that highly positioned. No wonder teens hate to read if books like this are on their summer AP reading lists.